This year, I wanted to change things up abit. Our family room is rust, gold, and bronze. I thought I would create a gold and cream theme. My husband and I ventured down the hill today to visit Pottery World. 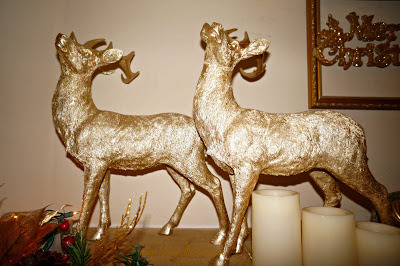 My last post featured some fabulous decorating for the holidays. We indulged in a nice lunch and then proceeded to browse. What's not to love in this amazing store? 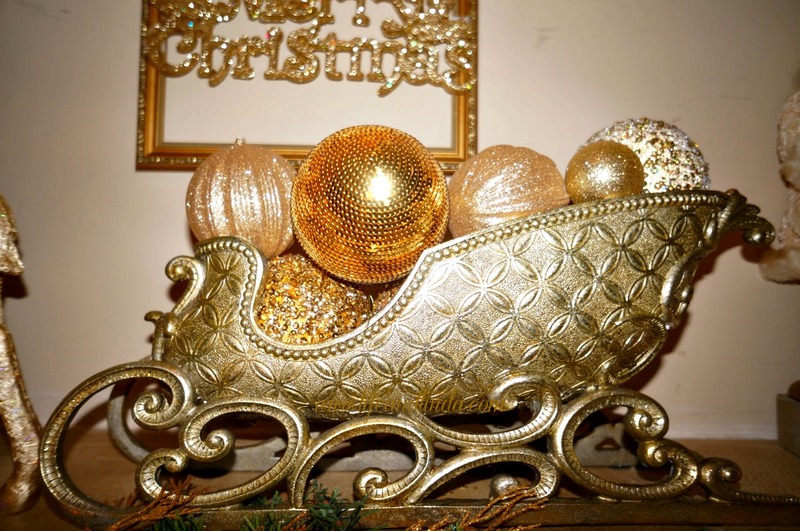 The gold sleigh immediately caught my eye. Check it out! There's more to come.....I did tweak my back alittle, while pulling down heavy bins. My husband suggested skipping decorating this holiday.....Not! Hi Linda! Your mantel is just gorgeous! I love all of the goldeness you've used. I just loved your dancing too! You're amazing. Everything that you do is elegant, Linda. Love the mantel. I finally got mine done today, but it is far from elegant. Be careful with that back! Those "tweaked" backs can keep ya down if ya don't watch it. 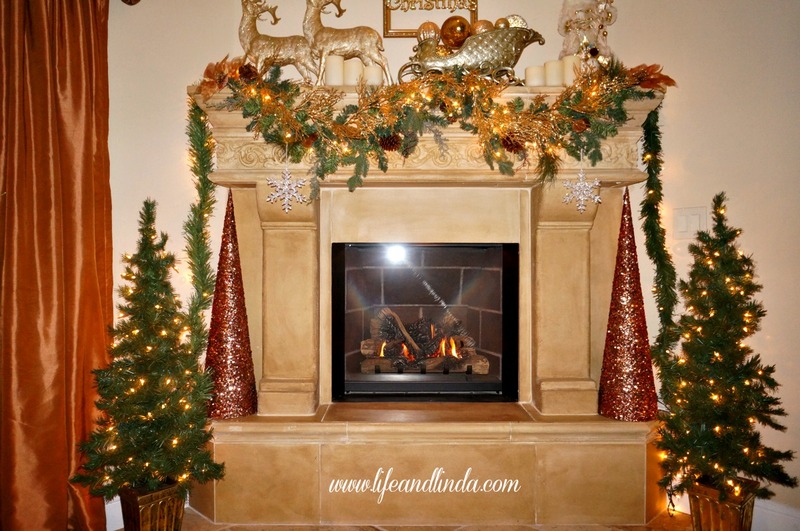 Linda, your mantel is gorgeous! Love the colors that you're using! Everything looks so elegant! That is such a glamorous mantel! It's so pretty! That sleigh is the perfect focal point. Your home is so beautiful and your mantel is no exception! And your little elf is so darn cute :) I can't wait to see more it is inspiring me to get the Christmas decorating done! B e a u t I f u l!! Your sleigh is darling! 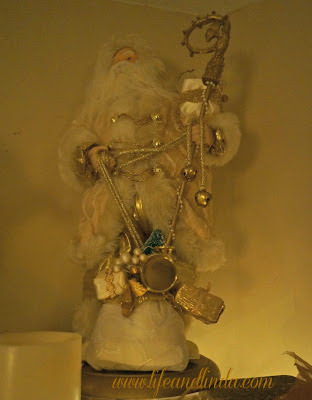 Love the ornaments in it and your Santa! Definitely elegant! Beautiful in the evening with the lights! Linda, your mantle looks gorgeous! I especially love the evening photo with it all lit up and glowing. Wow! This is gorgeous! Linda, can you come to my house and decorate?! Everything looks so festive and bright. Love it! 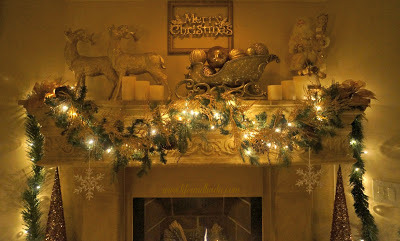 Linda, your mantle and sleigh are beautiful and I love your two, little elves! I'm in love with your sleigh!!!! So so lovely and I like the twinkling lights when you dim the room lights. So envious of your gift. Why do you deal with digital design?. You'd be a blessing for lessed gifted people decorating their homes - if only for the Holidays. So envious of that Sleigh finding. You always grab the loveliest things. LOL You've been "elfed." So cute! Your mantel is stunning, LInda. LOVE all the gold details! I'll be tree hunting today after leaving the studio. Wish me luck! Thanks for your visit. The sleigh is gorgeous, as is the entire mantel. You did a fabulous job! Enjoy!! Elegant definitely describes it. I love the white lights to make it all glow. Linda, I love your mantel! It's stunning! I love your sleigh! It'a all so festive! Thanks for stopping by and nice comment. I have really cut back on decorating the last few years. Hi Linda, Beautiful mantle. 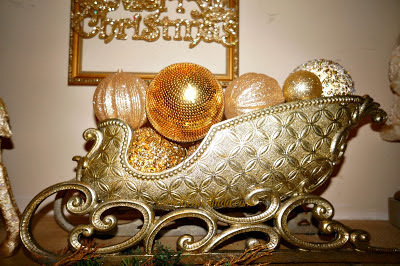 I love the sleigh and raindeer and the swag if a gorgeous finishing touch. Great dance moves!!!! Thanks for stopping by Queenie's wee blog and being a follower. Your mantel is decorated absolutely beautifully! So pretty and festive! LOVE it! Linda, can you by any chance send me the header picture from my blog???? I tried to copy it but that didn't work..if not don't worry. Thanks!!!! Very elegant Linda. The sleigh is gorgeous! Sure hope your back gets better. Sore backs are the worst! Thanks for sharing with Share Your Cup. Your mantel looks amazing, I love the swag and the combination of gold and cream. 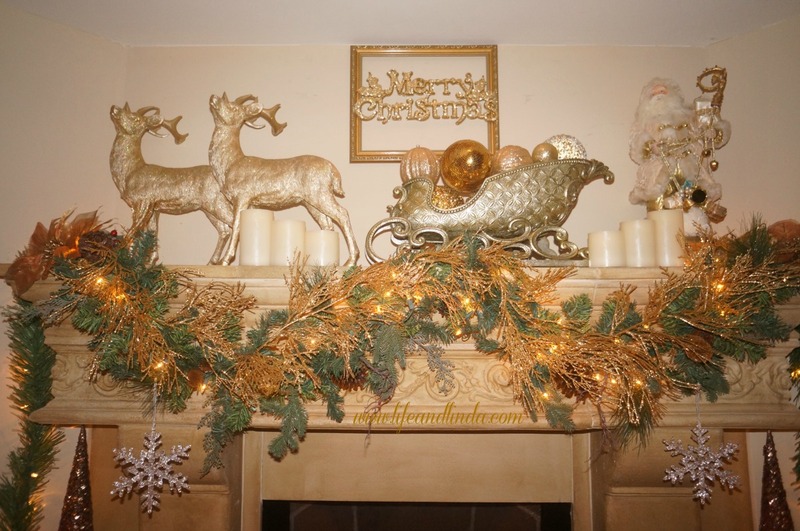 I am using silver and gold this year for my decorations but have a simple mantel I used some gorgeous white orchids and hung a wreath with gold organza ribbon from the top of the mirror. I then suspended a little fine strand of silver stars across the mantel. I am really pleased with the results. Hopefully the orchids will bloom for quite some time. I love your mantle, the warm golds very classic and elegant!